We see many different types of stone in the buildings around us and thinking about them in a very simple way, can add interest to our everyday walks. 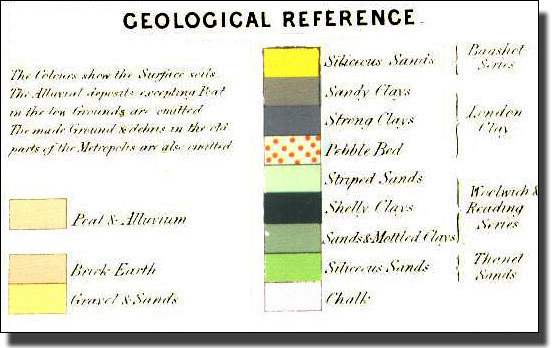 Geology sounds difficult. Call it ‘London Stones’ and it becomes easy. There are three main types of rocks; Igneous, Sedimentary and Metaphoric. These are all used in building, so walking through some streets that have a large amount of stone is like walking through a geological museum. Igneous rocks are rocks which have melted their way through cracks and vents in the older rocks, from deep within the crust of the Earth. In some cases they force their way through to the surface and appear as molten lava. More often they slow down before they reach the surface and cool underground into solid rock. As they cool, the different minerals which they contain form themselves into crystals of different and often beautiful shapes. There are two things to remember about this cooling. First, the slower the melt cools, the larger the crystals, because large crystals take a long time to form. Second, the minerals do not all crystallize out at the same time. The ones which solidify first are free to assume their perfect crystal shapes, while still surrounded by other minerals in pasty form. When these later materials crystallize out at lower temperatures, they have to make do with the spaces that are left. Often there is not room for these ones to assume their perfect shapes. Prismatic crystals of white quartz (silicon dioxide) SiO, and iridescent halcopyrite (sulphide of iron and copper (C-u Fe S2). These are crystals of quartz which have been free to develop their perfect crystal shapes. The Granite and Gabbro shown below did not have room to develop their full crystal shapes but had to fit in to the spaces left by the minerals which had crystallized out earlier. Sedimentary Rocks - the Limestones and Sandstones. Sedimentary rocks are those laid down in layers, usually by the action of rivers or the sea. 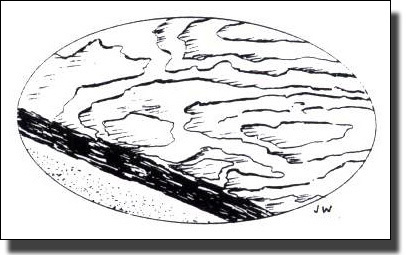 The original layers will be roughly horizontal but later earth movement can upend the layers and even turn them over in folds, as we can fold over a tablecloth by pushing the two sides together. Limestones are white and consist of Calcium Carbonate in different forms. It may have been laid down as white granules in tropical seas, just as it is being deposited on West Indian beaches today. Water can dissolve Chalk (Calcium) so that it becomes invisible, just as a spoonful of sugar dissolves in a cup of tea. When water is under great pressure it can dissolve much more Chalk than when the pressure is released. Deep water, is under great pressure from the weight of water above it, so it is full of dissolved Chalk. When it comes to a desert Island, the water is suddenly lifted up to the surface. The pressure becomes much smaller and the Calcium turns into tiny beads of Chalk which are deposited on the shore as a white sand. They are like tiny eggs, so we call then Oolites (Latin for egg). 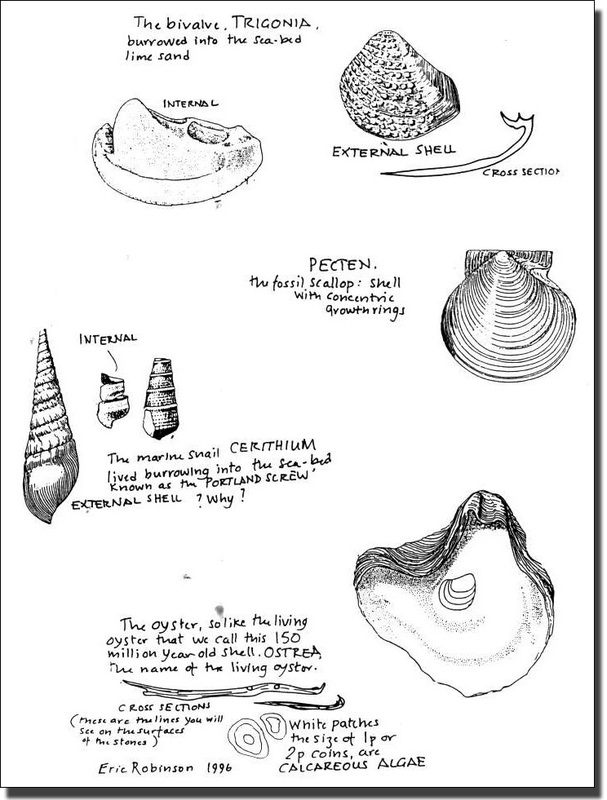 Snails and oysters use the chalk to form their shells. Then, when they have died, their shells rest on the sea bed and may become part of a Limestone Rock. This is a limestone which can take two forms. The first is a compact and solid limestone with only a few clearly visible fossil shells standing out from the surface. 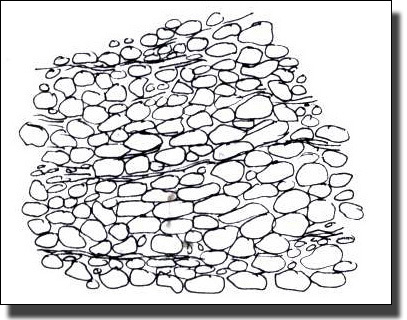 Look closely at the surface and you will see that the stone is made up of thousands of close-packed round grains. 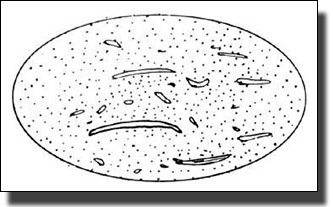 It looks like cod-roe, and this fish-egg texture is why geologists call it OOLITE (Ooion = Greek for egg). Lime is always likely to be attacked by even mildly acid waters, but as everyone knows these days, the rain which falls on cities has an acid character, so in London, Limestones slowly begin to show roughness where they were once smooth. Over time a sign of weathering will be the emergence of fossils. This can be seen on the white limestone gateposts to the The Town Hall in Church Street. When the these posts were built in the 1930s, the stone surfaces were smooth, but the weathering since has made the shell fossils stand out. Typical fossils which may be found protruding from Portland stone surfaces. This is a limestone which is crowded with fossil shells, most of which have had their lime shells dissolved away, leaving the stone full of shell-shaped cavities. This stone is known to the quarrymen of Portland as 'ROACH'. There is no example of this in Church Street but one can imagine it with large spiral shells like Cerithium dissolved out leaving holes of the same shape. Today large panels of this Roach Limestones are used as decorative facing for many concrete walls in the City of London. If anyone knows of a local example of Roach, I would be glad to hear of it. During the mullion years which we judge to cover the Ice Age, the ice melted and froze again. When the ice melted, it poured in torrents over the limestone outcrops of the north Pennines. The water dissolved the stone, producing the fantastic shapes which we now see in what are called 'limestone pavements'. These are huge white deserts, split and divided into thousands of irregular blocks, with ferns and tiny trees growing in the cool cracks. It is illegal to remove these blocks of limestone today but one can sometimes come across them in old rockeries. The picture below shows one such block, with deep channels cut by melt water over perhaps thousands of years. A water-worn block from a limestone pavement, pitted and furrowed by solution. This limestone is Carboniferous Limestone, probably from Yorkshire, and at least 320 million years old. This is more than twice the age of the Portand Stone gateposts (130 million years old). The section shows the two deep channels cut by running water over thousands of years. Limestone was once the white muddy bottom of some tropical sea. It was not hard and only became hard when the land was raised and the muddy ooze dried into stone. It was just like the sea shore mud in any West Indian island today. This sea bed was full of creatures like prawns, worms, snails and oysters. Seaweeds and sponges grew in the shallow water. The prawns made burrows and hid in them. Later, perhaps very much later, their burrows were filled with more limestone grains and these fillings show up in our modern limestone blocks as patches of a slightly different colour. 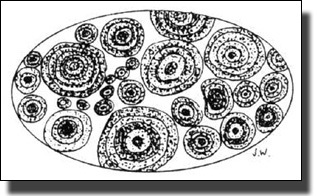 Sometimes they are round patches and sometimes they are irregular patches where the networks of burrows have been cut through horizontally. Small white patches in Limestone are likely to be the burrows of these creatures which have been dead for millions of years. The sponges can show no fossils because they were made of such soft material. They did not leave anything to fossilize. They did however leave their shapes. Limey mud built up around them and, when the sponge died, it left a hollow in the mud. This hollow was then filled with limestone grains of a slightly different type. The surface of some Limestone blocks changes slightly. Smooth patches suddenly become rough: white becomes grey. The change line may show the outside of some sponge which once lived in shallow water. It died and its shape was preserved in a change of texture. Run your hand over the block and you can feel the story. of the formation of the Portland Stone. 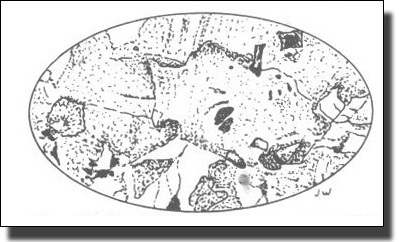 Calcareous algae are rubbery mats which trap fine lime sand and partly precopate calcite (lime) from sea water. 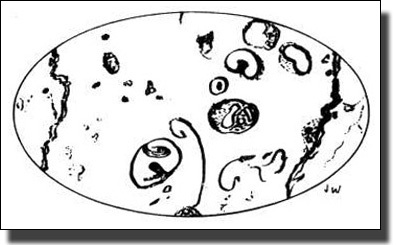 The algae has no internal structure as such and no tissue is fossilised. The other great class of sedimentary rocks is the Sandstones. These consist of tiny grains of sand laid down by water or by wind. The river sand has been broken down by the battering water breaking stones into tiny pieces over thousands of years. The sand is deposited in layers which slowly harden into stone. Desert sands are different. In dry hot climates the sand is blown in giant sand storms which fill the air with particles of sand dense enough to obscure the sun. This can happen day after day, so that the particles bombard each other and knock off the corners of the grains. Therefore river-laid sand tends to be sharp, while desert sand particles are rounded. The difference shows up under a microscope. The traditional London paving has been York Stone and right up to the present day, new slabs are being laid on City streets. Many pavings become polished and slippery with wear, but this does not happen so much with York Stone, for good geological reasons. York Stone is a sandstone which was formed as a sediment on the bed of a great river system, 300 million years ago in the Carboniferous period. 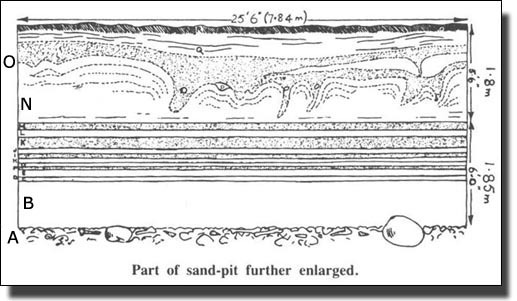 Sand grains were deposited layer by layer by the flowing water. The sand layers were separated by thin spreads of the silvery mica flakes which settled when the waters were still. Wear and tear of York Stone cuts it down layer by layer, from Mica layer to Mica layer so that the non-slip sand surfaces are constantly renewed. This wear used to be much more rapid than it is now. Most people walked backwards and forwards to work. Every morning and night an army of men used to walk from Islington to the City and back, with large steel nails in their shoes. Their shoes were studded with these Blakeys to stop wearing out the leather soles. Instead they wore out the pavements. The layers of mica flaked away leaving fresh layers of fresh sand. The stone became rough again instead of smooth and slippery. Today we tend to use softer soles to our shoes and do not walk so much, so the wear is slower. Sometimes, we can pick out ripple-marks as bands running across the surface of York Stone. These were formed when the sand grains were ruffled by the currents, just as we can notice on a beach or sandy stream edge today. Granites and other igneous rocks worked themselves through the older rocks by melting their way upwards from the depths of the Earth. They found weak spots in the crust, especially in the roots of mountain chains, melting and heating the surrounding rocks as they moved. Older, sedimentary rocks which had lain undisturbed for millions of years were suddenly heated and put under great pressure by the burning magma. Sometimes the melt reached the surface and poured out as white hot lava, like a steel furnace being tapped. Sometimes it burst out as clouds of ash and flying debris, as it did when Vesuvius buried Pompeii, filling every crevice with powder and covering the fleeing people in shrouds of stone. When melts fail to reach the upper crust of the earth, they cool slowly and solidify, the mineral content crystallising into well-formed shapes. Slow cooling allows large crystals to form and we then have a typical granite forming perhaps five miles below the surface of the earth. Millions of years later these softer covering rocks may have been eroded away by water or wind to leave the granite exposed at the surface. The immediately surrounding rocks are changed by the heat and pressure of the melt into very different rock types. These are the Metamorphic Rocks. Marble is a metamorphic rock (Greek: meta - change, morphe - form). At one time it was limestone, a sedimentary rock similar to Portland Stone. Then the limestone was subjected to intense heat and pressure by some geological event such as mountain building stresses. When the rock cooled it had been changed (metamorphosed) into marble. Any fossils in the limestone would have been destroyed and turned into marble with the rest. Sometimes the heat was not sufficient to completely destroy the fossils and they can still be traced in the marble. 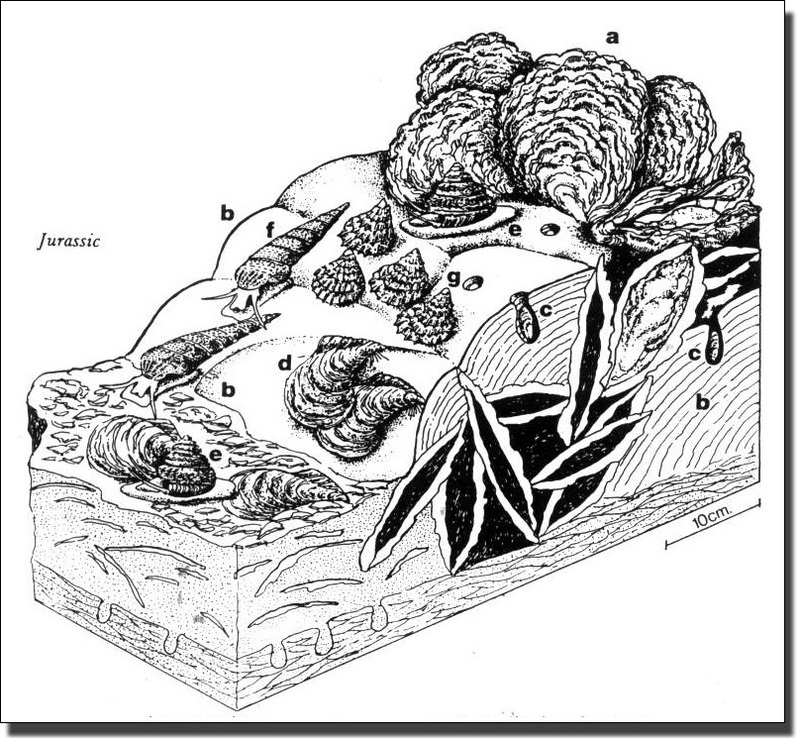 Snails (gastropods) can still be seen in the Pictra Persichina di Prun marble in the illustration. In other cases the fossils are completely destroyed and the marble is re-crystallized, as in the Blue Crystal Marble in the second illustration. not heated enough to melt them. The heat completely destroyed any fossils which may have been in the limestone and it is completely crystallized. Carrara Marble is a particularly fine white marble which is prized for the very best sculptures. Sometimes layers of Clay or other material were mixed with the original Limestone and when this was converted into marble they became dark streaks in the new stone. These are called stylolites (Greek stylo - pen). This usually spoil the marble for sculpture, so this marble is used as fishmongers’ slabs. There are three main sorts of slate used in Britain, Welsh roofing slates, Green Cumberland Slate, and Cornish Delabole flooring slate. Welsh roofing slates cover many Stoke Newington houses. St Pancras Station has been re-roofed recently in Green Cumberland slates. If anyone knows of any local Cornish Delabole slates we should be glad to know of it. In 'One Man's England', by W.G.Hoskins, there is a photograph of the enormous quarry at Delabole where slate has been extracted for 400 years. With luck, there is an example of this slate somewhere in Stoke Newington. Any fine-grained material can be converted into 'slate' by pressure. The blue/grey Welsh Slate was originally a fine-grained mud. Its flat platy minerals were squeezed into parallel sheets by the immense pressure of mountain building. The parallel sheets are what are called cleavage planes, which allow the slab to be split easily into thin roofing slates. Cumberland Slate, sometimes called Lake District Green Slate, is actually a fine volcanic ash which has had its platy minerals compressed so that it too can be cleaved. It cannot be so thinly split as Welsh Slates as the mineral grains were coarser. This Green Slate is a most unusual geological material. It was blown out of a volcano as a fine dust. Therefore it is an Igneous Rock. The dust fell on local lakes, sank to the bottom and and was laid down as a series of layers, so it is a Sedimentary Rock. Finally it was compressed sideways under immense pressure and changed (metamorphosed) into Slate. Therefore it is also a Metamorphic Rock. It has been all three types of rock but at immensely different periods of time. By looking closely at split slates it is sometimes possible to see where the slate was struck from the block. This is called the percussion point and fracture lines radiate from it. The slate cleavage paths may show some areas of white colour. These are probably Calcite veins and were formed in the original slate. and radiating cleavage lines coming from it. 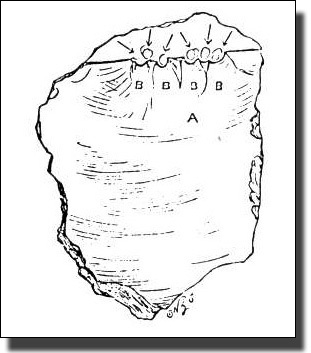 The same kind of percussion points can be seen in palaeolithic flint tools. See (Growth of Stoke Newington p. 14). 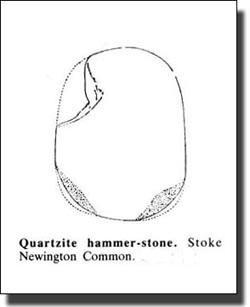 Stoke Newington Common is one of the most important Paleolithic sites in Northern Europe. In the 1860s, G. Worthington Smith, a colourful character in a flowing cloak, began to discover a new world under his feet. He was tireless in visiting the area and examining pits, cellars and basements being dug for new houses, railway cuttings, and the freshly dug graves in Abney Park Cemetery. At this time the whole area was being covered in houses. 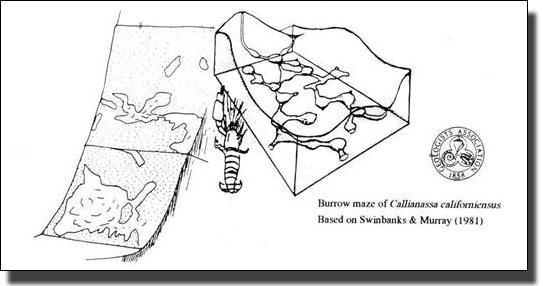 Cellars were then cut by hand, giving clean sections through the layers of humus, Brickearth, Gravels and Clays. In the Brickearth he found a thin layer containing sharp flint instruments. The layer was of sub-angular ochreous gravel 1-6" (25-150 mm) thick. This was the 'floor' of 200,000 years ago, and was generally 4-6 ft (1.5-2metres) below the modern surface. The Brickearth was laid before and after the 'floor' was laid. The 'floor' contained, besides the flints, a few broken bones, antlers and some driftwood. Probably there are so few bones and teeth because the acid conditions have destroyed them. Worthington Smith found traces of the floor from Stamford Hill to Highbury, in Blackstock Rd and elsewhere. In 1894 he wrote a book called 'Man, The Primeval Savage', summing up his years of investigation, from which this information comes. 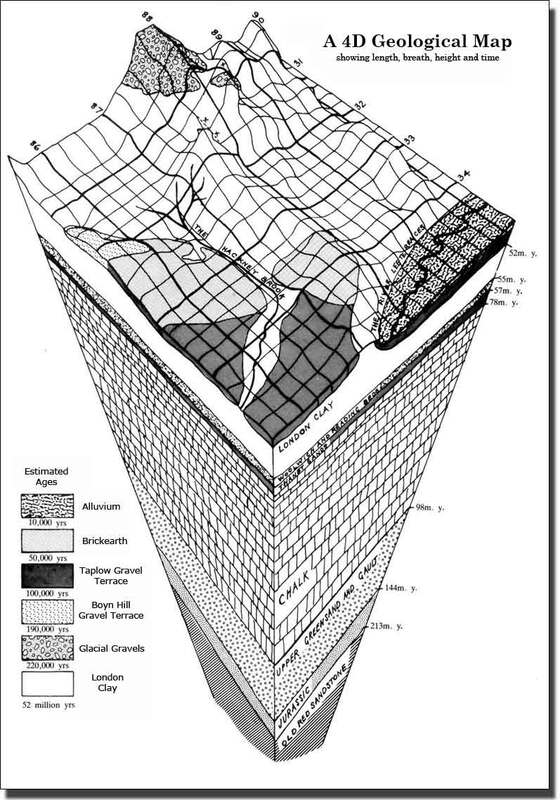 The cross section shows the various strata clearly. 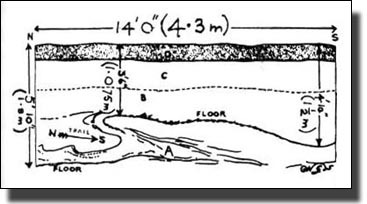 Gravels A, B and C are roughly horizontal and the brook has cut the curved shape H through them. They were laid down before the Hackney Brook and J. E. Greenhhill, a colleague of G. W. Smith, used this to show that the Hackney Brook was cut after the Thames had cut its present valley (Thames 3). Above H are the level layers of sand E laid down gradually by the brook. F shows where the contorted drift ploughed through the river bed in two places. There were four major 'Glaciations' in Britain separated by three warmer ' Interglacials' when the ice sheet retreated. About 300,000 years ago, the ice probably reached North London. In the final glaciation, it probably reached York. During the interglacials it t probably became as warm as today, causing the ice to melt, releasing quantities of water which temporarily made Britain an island. It produced very wide, marshy borders to the Thames and Lea Rivers, where men captured animals by driving them into the swamps. The earliest definite evidence for human occupation in Britain dates from the Second Interglacial, which began a quarter of a million years ago, but it is possible that the first humans arrived during a warmer phase of the preceding Glaciation. Imagine yourself in a sand-pit in Stoke Newington in the 1860's. Around you are the four sides of the pit. The diagram shows three of these sides opened out. At the bottom are the horizontal strata neatly laid down by water. Above is an irregular mass of. contorted drift. This is from the Ice Age. Sites of finds on Stoke Newington Common. 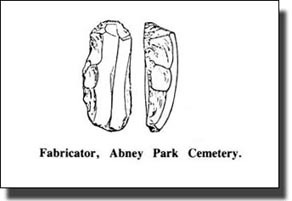 From ' Lower Palaeolithic Archaeology', by John Wymer, 1969. Slate spilts into more or less straight parallel surfaces as one can see by looking at any slate roofing tile. 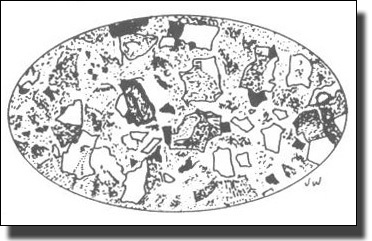 Flint, which is made from silica, splits with curved, (conchoidal), surfaces and because flint is so hard this form of splitting give very sharp cutting edges where these surfaces meet. Flint tools came in a rich variety of shapes. 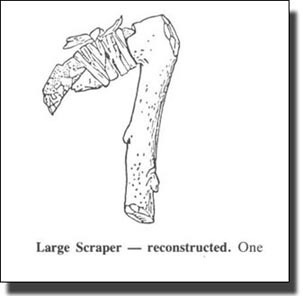 Some were used as hammers, cutting knives, scrapers for cutting flesh away from hides and some had tiny sharp points and were used as arrow tips. 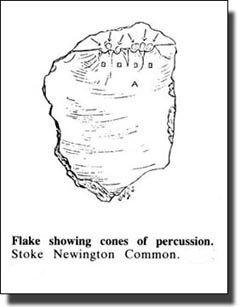 Flake showing cones of Percussion. 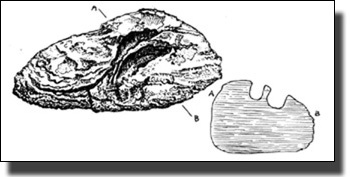 A flint nodule being worked into a flint tool and similar percussion points and cleavage lines. So very famous Palaeolithic flints were found in Stoke Newington which is one of the most important archaeological sites in Western Europe. The finds of Worthington Smith in Stoke Newington Common when the foundations for the new houses around Newington Common were being dug. 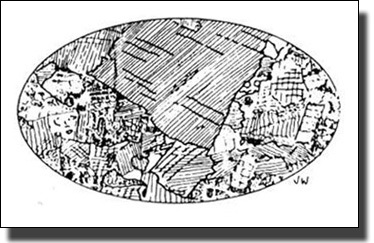 The map shows where flint axe-heads, scrapers, a quartzite hammer stone and fabricators for making flint tools, were found. Some of the implements, from the bottom layers of gravel, are deeply stained by ochre from the gravel. They have been 'rolled' by water, like pebbles, so their cutting edges are rounded. These are implements of the Oldest class'. Above them, about 12 feet (3 metres) from the modern surface, tools are less 'rolled' and stained. These are of 'medium age'. 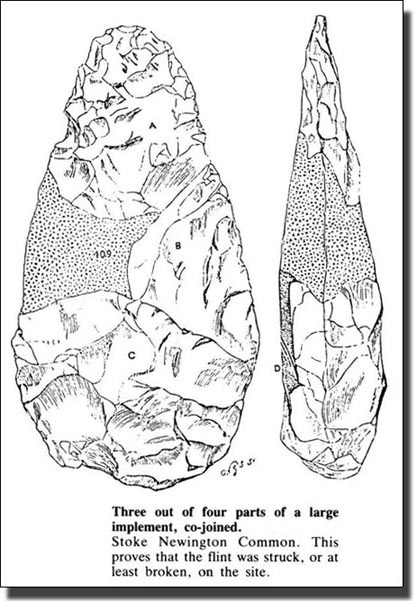 Above again, on the Palaeolithic 'floor', in the Brickearth, are implements with sharp cutting edges. Some pieces found within a few yards of each other, fit together. This suggests that these flints were struck on the site. Nobody would have carried pieces of a broken flint tool from one place to another and then discarded them neatly, near to each other. 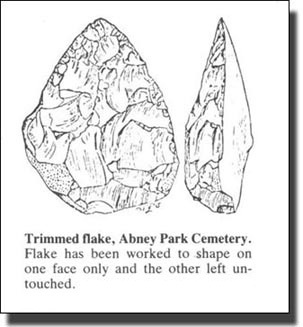 Secondly, the fact that the broken flints have been found so close together, proves that the water which covered them, and deposited sand on them, was slow moving. It would have been the marginal, slow flooding water from the main channel of the Thames. Also, some pointed sticks were found in Bayston Road, shaped for use. From all this evidence, we can see that people were living on the banks of the Hackney Brook 200 000 years ago. 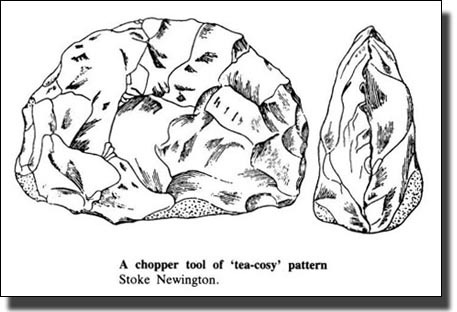 Flint tools became so popular that forgers in Stoke Newington flourished. Implements were made, stained and `dug up'. Some are still in museums with their `find sites'. Worthington Smith knew of this practice, made some of the forgers confess, and prevailed on them to make a tool in front of him. One man held the flint in two hands on an anvil, while the second split off flakes with a hammer and punch. Then the flakes were chipped to shape with a shoemaker's awl or a stumpy bradawl or gimlet. 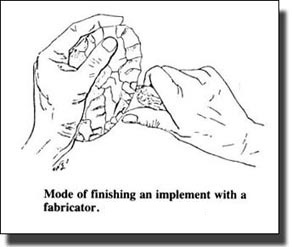 The Palaeolithic methods would have been similar but using stone anvils, punches and hammers. All of these have been found nearby. Presumably the forgers could claim that their flint tools were struck on the site, even if 200,000 years too late. This map shows the Stoke Newington area in Mylne’s Map. 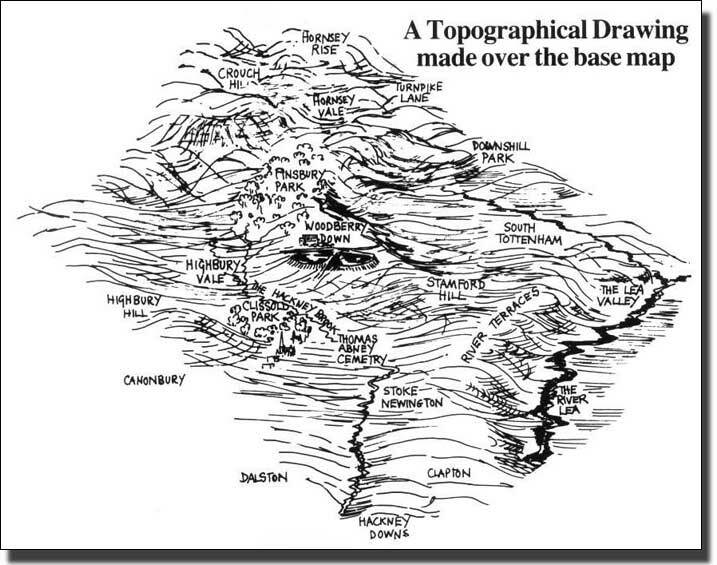 The Key to Mylne’s Geological map. R.W.Mylne (1816-1890), the author of the Geological map, was a distinguished engineer connected, amongst other things, with the supply of safe drinking water to the City. He carried out experiments which led to the digging down to the Chalk below London and extracting clean water from there by artesian wells. 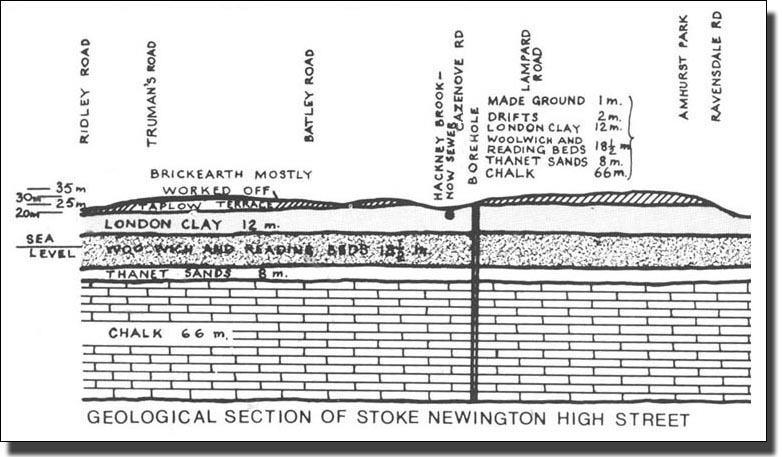 The only rocks exposed on the surface in Stoke Newington are Brick Earth, Gravels and Sands, and Strong Clays. Water must have washed away the Brickearth and Gravels in the area to the north of church Street, over thousands of years, to expose the Strong Clays. These clays still underlie the other two and can be found by digging down. 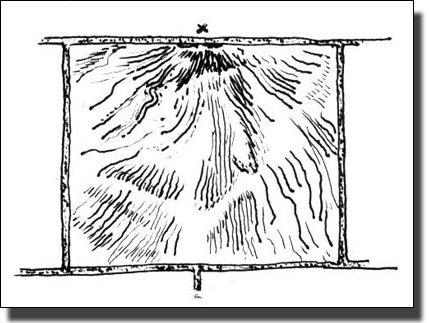 The next map shows how the Geology affected the House building after about 1800. The Brick earth and Gravel lands were built on first because gravel is self–draining and therefore houses built on gravels are dryer and healthier. Only when the Gravel lands south of Church Street had been built on, did the developers venture onto the Clay. Boyn Hill or High Gravel Terrace. This is a gravel terrace about 100 feet (30 metres) above sea level. It was laid down by the Rivers Thames and Lea. Over the ages, the rivers wandered about, leaving their old beds as terraces. Some of these were later cut away by geological action but pieces have been left. They made excellent building sites with good water supplies. Brickearth. During the Ice Ages, North Europe was covered in permafrost. In the summers, a few centimetres melted and were blown away by strong cyclonic winds to cover the o1d Taplow terraces. In time it built up to quite a thick layer and valuable layer of soil. It was baked to make the handsome red bricks for Queen Anne houses and also grew good apple trees. It is largely worked off today. The Taplow or Middle Terrace. This is a high gravel terrace about l6 metres (50 feet) above sea level and again very popular for house building and for roads as the drainage is so good. 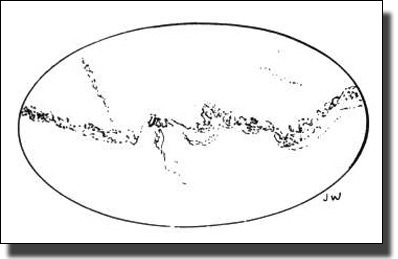 It was laid down in the latter part of the Second Interglacial Period, between the Second and Third Ice Ages. London Clay. This was laid down when the sea covered the London Valley. European rivers, carrying heavy loads of silt, deposited the larger particles near the shore but the smallest were carried far out to sea and laid down as Clay. This makes brown/red bricks, forms water tight reservoirs, lines canal beds, and gives wet cellars. Brickearth was laid down at about the same time as the Taplow terraces. It is rather like the Loess of the continent, a fine-grained, wind-blown dust. During the Ice Ages the North Sea and Northern Britain were frozen. The Continent was an area of permafrost which melted slightly in the summers. The Arctic was an area of high pressure and the Continent, of low pressure. This produced cyclonic winds, giving an almost permanent eastern wind over England. Each summer the top few centimetres of the permafrost of the Continent melted into a fine dust which was carried by the wind to be deposited in large areas of South Middlesex and South West Essex. The Mylne map shows that the Hackney Brook has washed away a narrow valley through the Gravel and Brickearth to expose the Clay. The Clay strip runs from Hackney Downs, past Upper Clapton, along Bendall and Jenner Roads, along Northwold Rd, and through Abney Park Cemetary. The Brook continued along Grazebrook Rd, across Green Lanes and into Highbury. The youngest, (London Clay), is higher than the oldest, (Chalk). 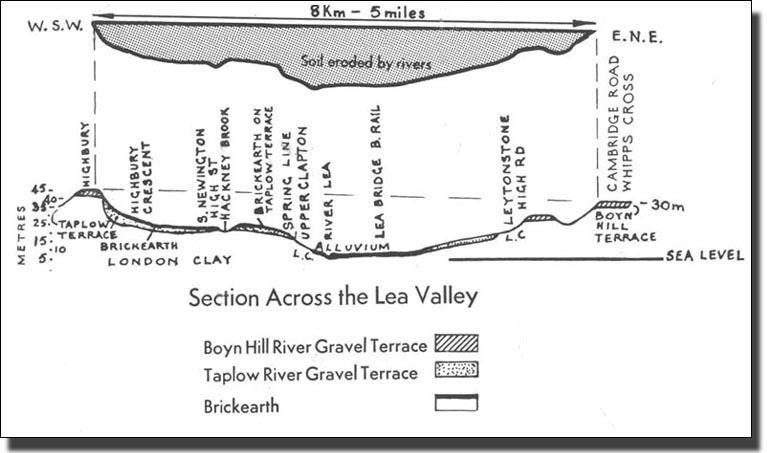 The section across the Lea Valley shows the Boyn Hill Gravel at Highbury, in Leyton and at the Cambridge Road. The Taplow Terrace Gravels are cut by the Hackney Brook and the River Lea. The Lea has filled its flood plain with Alluvium to form the Hackney Marshes. Highbury and the Cambridge Road are about 30 metres above the sea level. The Lea is at about sea level. Think of the amount of soil the River Lea and the Hackney Brook have swept away into the North Sea to form the Dogger Bank. 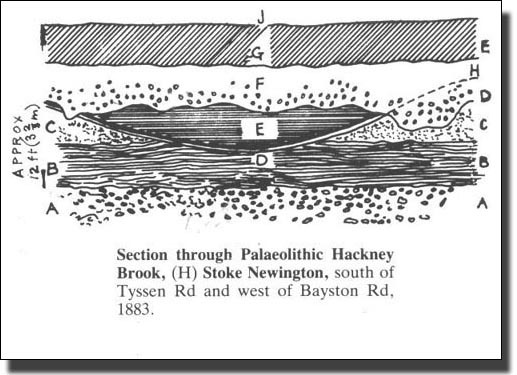 The geology of Stoke Newington is a series of layers, one on top of the other. Gravel terraces and Brickearth rest on the London Clay. Far below is Chalk. Stoke Newington Church Street grew up on the edge of the gravel area. To the north of the street is London Clay: To the south is gravel with a thin layer of Brickearth still left in some places. This Brickearth has been largely worked off to make the red Queen Anne bricks seen in for example, Sisters' House in Church Street. 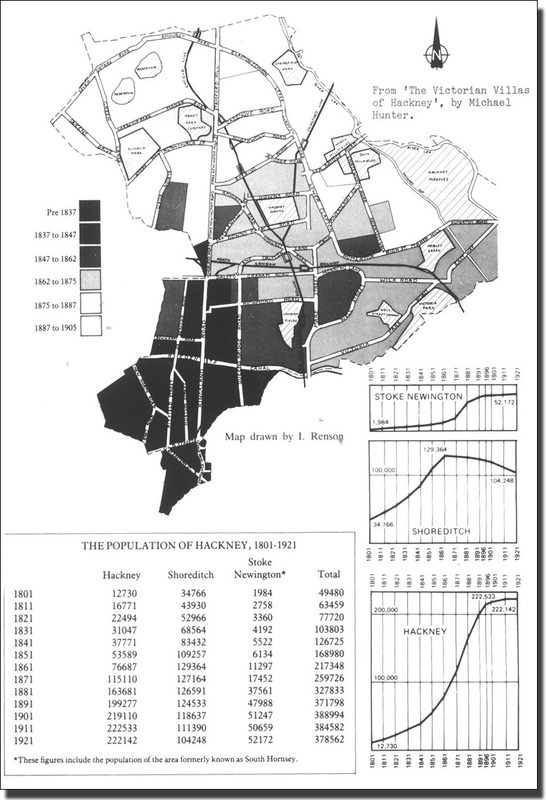 The Hackney Brook drained the south-eastern slopes of Holloway and the north-eastern slopes of Pentonville. It flowed along the flat land of Gillespie Rd and Highbury Vale, collecting more drainage water from Finsbury Park. It cut a valley south of the ridge on which the Seven Sister's Rd and Stamford Hill run. At Abney Park Cemetery the river turned south-east along Northwold Rd, past Hackney Downs through Victoria Park to Old Ford where it lost itself in a mass of drainage ditches before reaching the River Thames. Water drains far better from gravel than from clay, so people preferred to live on gravel. The houses were healthier, with fewer cold mists and dripping walls; wood did not stay wet and so rot; the roads were passable in all weathers, whereas clay became a mire in winter and formed hard ruts in summer, upsetting carts or turning ankles. So long as there was gravel left to build on, nobody built on clay with its bad foundations and wet cellars. As it was, a high proportion of builders went bankrupt every year. Choosing clay foundations would have made this even more likely. Today the Hackney Brook is underground and provides water for the Hackney Sewer, but the memory of the open river lingered on. Until a few years ago there was a `Riverside Shoe Shop' in the High Street. Rivers and their tributaries are hard to destroy completely as houses built in their old beds can still remind us. This Geological slice down into the earth stretches back more than 213 Million years in time. At the too are the Hackney Brook (now hidden below the ground in culverts but appearing in short stretches through the Borough as it makes its way to the Lea). The Hackney Brook has cut through the Brickearth and the Taplow Gravel to reach the London Clay. On the other side of the ridge leading up to Stamford Hill, is the River Lea. It passes through the marshy Alluvium which it has carried down for thousands of years, and laid on top of the Taplow Gravel. At the top of the ridge is a layer of Glacial Gravel laid down in the Ice Age. The John Rocque 1741-45 maps show that the Hackney Brook rose in Upper Holloway but it was fed by streams of surface water, and by springs which rose at the gravel/clay joints, all the way along. Water soaked through the gravel, met the clay and seeped out. No river is shown to the east of Hampstead Heath before Upper Holloway. Presumably, all the rain in this area soaked through to the clay and fed the River Fleet or the Hackney Brook. Today, in wet weather, parts of the Clissold Park football fields become very wet where the Highbury rain seeps out. When the tall, modern flats at the bottom of Queen's Drive were built, they ran into a spring and had trouble. 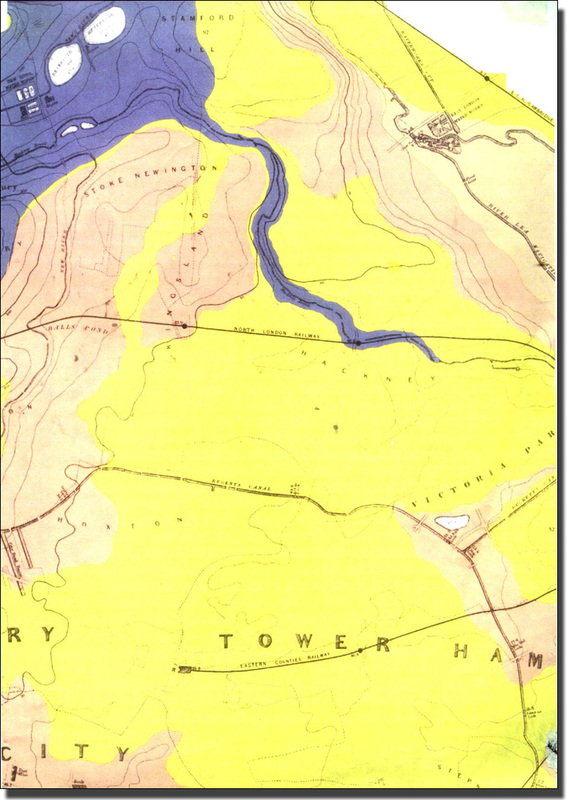 The six-inch Geological Map shows a row of ponds along what is now Grazebrook Rd. 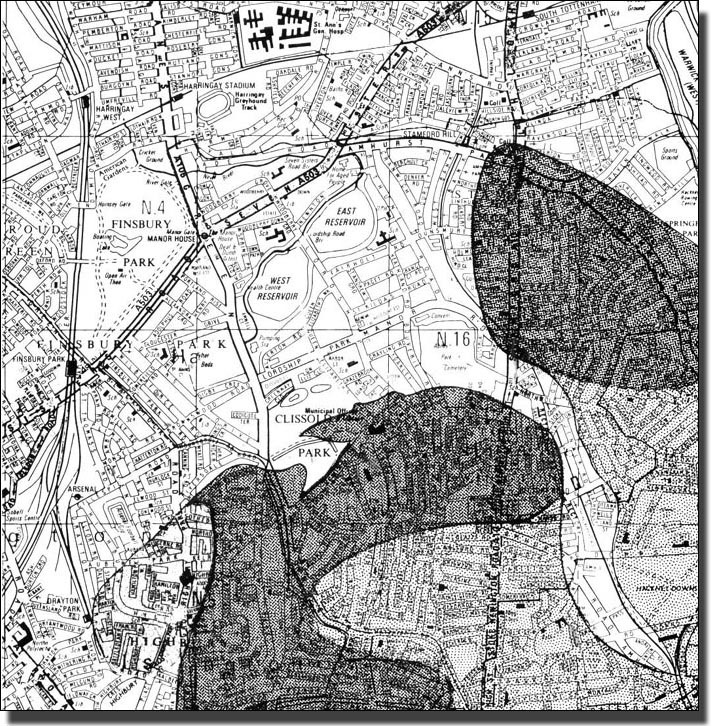 Standford’s map of 1862 shows,`The Hackney Brook now obliterated', curving from the Clissold Park fish ponds, around the northern edge of Abney Park Cemetery. The river here must have been swelled by the springs from Stamford Hill and South Hackney. The total flow was large: in 1860, the flow was "400 cubic feet a minute in the driest weather". Stoke Newington Church Street arose as a pathway, on the gravel, between the High St and Green Lanes. Houses there could find water by digging shallow wells. One, in the yard at the north end of Clissold House, had water only six feet (two metres) down in November. Deeper wells could reach the cleaner water of the chalk, far below. The 1895 O.S. 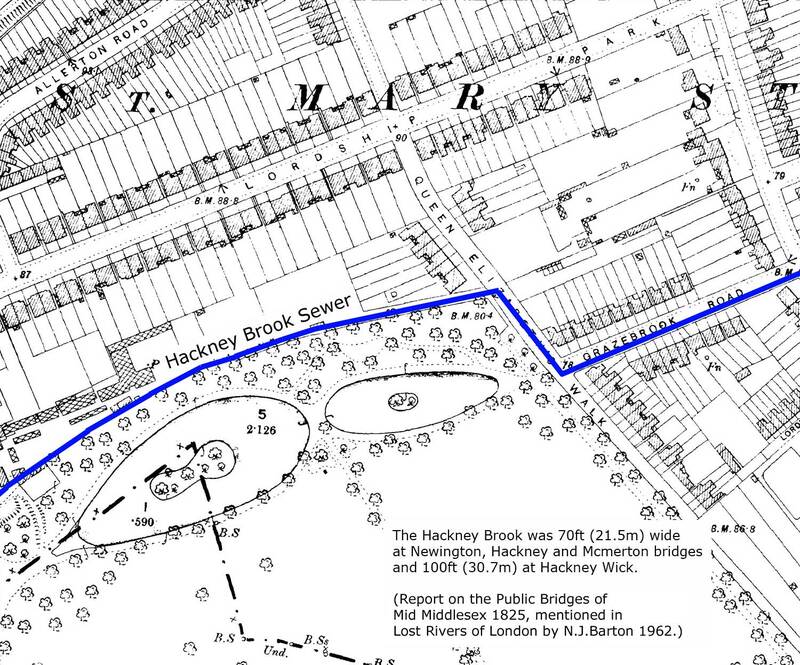 shows the Hackney Brook incorporated into the Hackney Sewer. This would have carried off most of the flow, but the springs and tributaries which fed it after Clissold Park, still continue to flow. These still fill the Fish Ponds in the Park and, no doubt, provide ornamental water and wet cellars all the way to Old Ford. 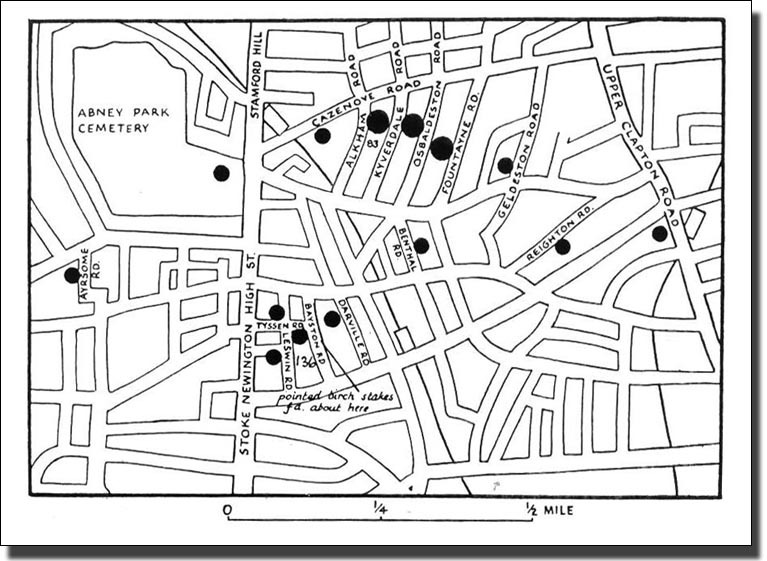 This map shows the dates of the early houses in each neighbourhood but of course there will have been later building to confuse the picture. Some areas will have been almost completely swept away, with perhaps a few of the original houses on the fringes.